The 74th edition of the one true Dutch overnight race, St. Vincent de Tyrosse, experienced an all-time low entry of 19,424 pigeons. The decision of the ZLU-board that this classic race would no longer be counted towards the National Marathon, and the difficult preparations for the race because of the adverse weather conditions, will both have played a part in this. Also the increasing aversion that many fanciers have against the afternoon releases will have been a factor. However, despite all this, many ‘ordinary’ long-distance racers are still gripped by the so-called St. Vincent fever. Because winning this race definitely still means something very prestigious, and the night of Friday to Saturday will have been a restless one for many fanciers. The earliest notification came from the village of Hoofdplaat in Zeeland, where Herman Calon clocked a returning pigeon at 4.38 am. Although in the end this time was surpassed by a pigeon from Loek Waasdorp in Domburg, that returned at 4.42 am and which in the end became 1st in sector 1 against 10,123 pigeons. 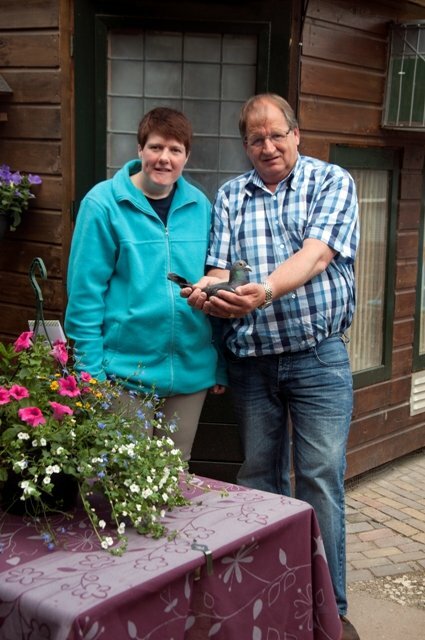 But for the fastest Dutch pigeon we have to travel to Baarn. 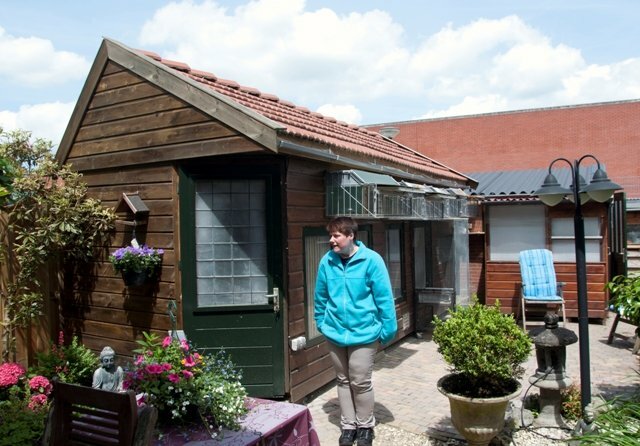 The village of Baarn has some 25,000 inhabitants, and is situated in the Province of Utrecht, between Soest and Hilversum. Baarn is best known for the royal residence, Paleis Soestdijk, where in former years Queen Juliana and Prince Bernhard resided. And in Prince Bernhard, Baarn knew a prominent ‘pigeon fancier’. Back now to the race from St. Vincent. In the early hours of Saturday, butcher Bob van den Hoek (61) saw his three year old dark widower ‘119-10’ speeding back to the loft. With a ‘beep’ at 5.15 AM this meant a speed of 1787.53 m/m over a distance of 1068,645 kilometres, calculated according to the complex Dutch system. And with this feat, the descendant of a real pigeon fancier family won the greatest triumph of his life. 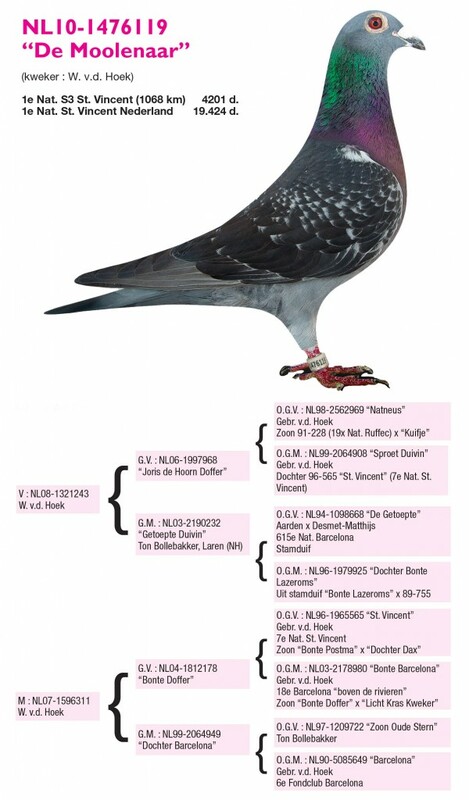 The winning pigeon, the ‘De Moolenaar’, once came back injured from a race, and was thereafter not entered in the remaining young bird races. In 2011, he won a small prize in the race from Orange and in 2012 he didn’t achieve spectacular results either. The ‘De Moolenaar’ waited until last Saturday with a fabulous result. He entered the basket as second nominated of five, and the preparation was on the natural system. When we spoke with Bob on Saturday, he was still in shock. On Sunday, with the assistance of some friends and members of the family, he felt a lot better. One thing is clear: in the chronicles of St. Vincent, the name of Bob van den Hoek will be entered in golden letters!